I lost 4 out of 6 last winter but then turned around and caught 4 swarms this year. I now have 5 very strong hives and one small one in a five frame nuc, it was a small swarm I got just last week. I got 3 swarms in my swarm trap one was just a few days after I put it back up from the first one. then got a nice BIG swarm in JULY. here is the one I just got called on last week. I am a beekeeper. I have kept bees for over 30 years. It is certainly a fun and rewarding hobby if you like the things of nature. I will make a few comments. My first rule is: Suit up! this includes full covies, veil gloves and gauntlets. I don't like to get stung. I am very allergic to bee venom. I swell up and sometimes break out in hives. I always carry two benadryl tablets on my person whether going out the bees or not. No telling when one might get stung........................ ? If I get stung, I get the benadryl in me at once. Sometimes when I am going out to rob and know darned well I will get stung several times before finishing, I take the benadryl before going out. Then if I get stung I usually won't have a reaction. Mice: Usually a good strong colony will keep bees and robbers out. However in winter, it is best to put an entrance reducer on the hive and reduce the entrance to 5/16 X 3 inches. Now a mouse can't get in. Entrance reducers are also of benefit to weak colonies and new installs as it makes it easier for them to defend their territory against robbers. Feeding: I usually feed in the spring to medicate the bees. I always try to leave enough honey on the bees that I don't need to feed them to avoid starvation. I always feed new package bees. One way to feed is to have a couple of supers of sealed honey on hand and just take out an empty frame and give the bees a loaded frame if they need food. . This is not always practical. There are several methods to feed sugar syrup. A feeder board and a jug of sugar syrup with a few pinholes punched in the lid inverted over the hole in the feeder board is what I prefer if I am just feeding a few colonies. Feeding in the open is an option that I use in the spring when medicating. Just fill a 5 gallon bucket with sugar syrup, put in the medication and float a bunch of wood chips on the surface then go set it near the bees. Yes, you will also feed any wild bees and a few wasps, but they all get medicated too. Which may be a god thing to hold down disease? Can't prove this, but its worth considering? Swarms: swarm traps may work, but never have for me. If you leave a box out to attract a swarm , it will attract robbers and they will tear it down for you. I find the best thing to do about swarming is check your bees regularly, every ten days in swarming season and cut out swarm cells. If you get a swarm, now put out a box and then go shake the swarm into a bucket and go dump them in the box. I cut a square of plywood large enough to cover a 5 gallon bucket and cut out the center about a 7 inch square and put screen over it. When I shake a swarm into a bucket, I then put the screened cover over it to keep the swarm in the bucket. Once you have most of the bees and the queen in the bucket, the rest of the bees will follow the queen and come sit on the bucket. I started keeping bees about 1973 if memory serves......... memory is not good these days. Yes it is certainly a worthwhile venture. The bees are interesting. Rule one: If you are going to mess with the hives, suit up. Full suit, covies, veil and gloves. No use getting stung. It is painful, and dangerous. Keep some Benadryl close to hand, if you do get stung take a couple of tablets immediately. I would suggest keeping bees in a two box deep hive, then you need a honey super and queen excluder. Unfortunately the equipment is rather costly. For what you need for one hive plus the bees, you are likely to have over $300 in one hive. The equipment lasts a long time though. Bees come and go. It is best to go for two or three hives rather than just one. Then you have some resources if there is problems with one. Good books are a must. Learn about the bees and beekeeping ways from books. Has it really been so long since I posted here? Wow, where does time go? Spring of 2014 I had only 1 surviving hive, and it had very few bees, just enough to claim that I still had a hive surviving. The extreme cold, the mice, the pitiful excuse for a beekeeper... all worked together. During the summer, I bought a hive, made splits... two of which weren't successful at all... ants seem to have killed them off. I made two more splits, one worked well, and the other seemed okay, then they absconded on me... just gone... bag and baggage. I made one more split and had opportunity to buy one more hive, just before closing up for the winter. Anyhow, wins, losses and purchases... I went into winter with 5 hives. Three were strong and two were borderline. Oddly, two of the three strong ones didn't survive, but the others did. I have three hives this spring to start out with. The two borderline hives are actually stronger than the "strong hive" of last fall that survived. The only thing amiss that we found was... mice! I don't know if the mice moved in and killed the hives or if the hives died then the mice moved in. And the other strong hive had mice also! Only the borderline hives had no mice. I think that I learned, to get the hives down to one box and then insulate and mouse proof it... I think the "strong hives" with multiple boxes were just too much space for the bees to defend and heat. It is encouraging that beekeepers with experience are still learning too. Sorry, that I have procrastinated and just not posted on here for so long. We lost one of the our four hives in January when the queen died. They were weakened by hive beetles and varoa mites. The hives have all been treated and the mites and beetles are under better control. 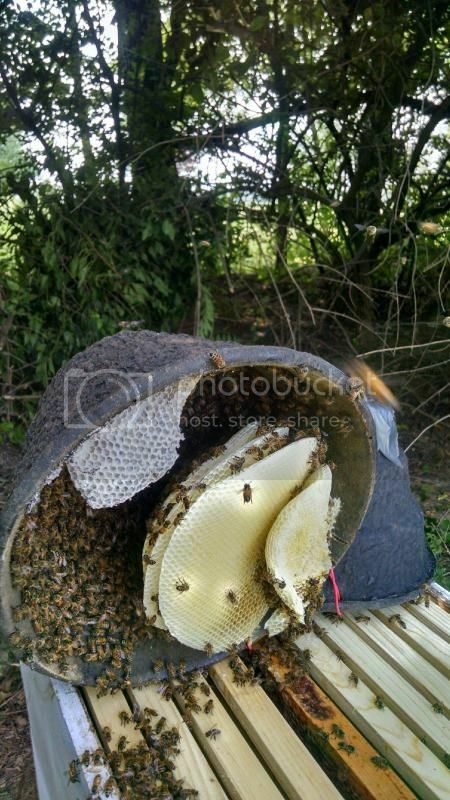 Drone and queen cells have been seen on the hive checks the last two months. One of the hives with an aggressive queen superseded and the new queen is a lot calmer. The hive is building so we just put the brood box from the hive that died on top of the newly re queened hive to build the bee colony up and later split the hive again. We are also getting an early honey flow. We just added more frames to one of the supers and have one super that is fully capped. That super will probably get pulled soon and frozen until there is enough honey to make it worthwhile harvesting. We are keeping an eye out to see if any new swarms appear since this is swarm season. I am new to beekeeping, but am fortunate that I joined the bee hui at the right time. We are getting bee lessons every month. This month we added the second brood box to build up the bee numbers to split the hive. We also had another hive that did not have enough frames in it so the bees build comb on the inner lid and the base of the brood box. So we learned how to cut the comb off the lid and bottom and cut and paste it back into the frame. Two months ago, we were shown how to combine two weak hives into one. Rule number 1: Suit up! I do suit up. In fact I wear two pants and I tape the pants and boots with duct tape and I usually ask someone to check my suit to make sure I have everything zipped up all the way. Now, that it is getting hotter, so is the suit. So far, I have been lucky, I haven't been stung yet. Most of the others in the group have. "So far, I have been lucky, I haven't been stung yet. Most of the others in the group have." This has me giggling. If you are going to mess with the bees, cover up! Yes you will get stung! It can also be dangerous. Do you know how you will react if stung? Many people are highly reactive to bee venom and it can even be life threatening. For sure there is a good chance you will swell up and have a sore spot for a week before it subsides. Ever heard of Benadryl? It is hay fever medicine and easily obtained. I keep some close by as I am quite allergic to bee venom. If I get stung, its time out till I get those pills in me. I carry a couple of Benadryl pills in my bee suit! OK, have fun and enjoy the hobby. It can be very rewarding. Sorry, I don't like this board software. It does weird things with my postings. I can reply to a post then later when I come back on to the subject my post is not there......... ?????? You have 8 posts on this 1 page, James. 3 posts here this afternoon. Were there more that were lost? I got stung. first time. Not through the suit but through the gloves. I have been stung by bees years ago working in my yard and I do not react. In fact, except for the pain, there wasn't any swelling or anything else. A cactus spine hurt more than that. I was able to get the stinger out quickly so that helped.
" I spotted a mouse nest, and a bee zapped me on the cheek. I hadn't suited up, thinking that I wouldn't need to open the hives at all. I quickly departed." Rule #1: If you are going to mess with the bees, suit up. That means the whole suit, coveralls, gloves, gauntlets, and veil. when going to work the bees and figure I will likely get stung, I take the Benadryl before going out. This old post pops up now and then. I had a good year with the bees. My son brought 20 colonies and put on my yard. I have a 2 acre lot here so plenty of room for that. I should tell you about how he got into the beekeeping bigtime? He lives across the state from me down on the Southern end. He is into Ham radio and knew the local law enforcement folks. Well he had a hive or two of bees since he grew up with the bees. Well, a semi truck hauling bees from back East out to California for pollination, had a wreck and crashed scattering 200 colonies of bees all over the side of the road. The cops get over there.... mad bees all over, so one of them said, "Hey Casey knows bout bees, get him over here." So he got the call to come pick up the mess. He found a couple of helpers and they got it cleaned up and hauled the bees over to a vacant lot and set them down. Later when asked what he should do with the bees, he was told the insurance had paid the owner for the bees, so guess they were his.